Iris [infragen. unranked] Euiris Benth. in Benth. & Hook., Gen. Pl. 3(2): 686. 1883. nom. inval. 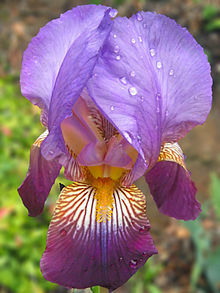 Iris subg. Pogoniris Spach, Ann. Sci. Nat. Ser. 3, 5: 103. 1846 (based on: Iris sect. Pogiris Tausch). Type species: Iris pumila L.
Iris subg. Pogoniris Baker, J. Linn. Soc., Bot. 16(1): 143. 1877, nom. superfl. USDA, ARS, Germplasm Resources Information Network. Iris subg. Iris in the Germplasm Resources Information Network (GRIN), U.S. Department of Agriculture Agricultural Research Service. Accessed on 24 March 2006.